It was a tough task to choose a winner, as the quality of work was exceptional. UKYA felt Jasmine had a strong and unique voice and her work could be translated across a number of different platforms. It was high quality, innovative and captured the spirit of UK Young Artists. We are super excited to work with Jasmine to create some unique mementos that capture the spirit of UKYA City Takeover. UKYA: Can you tell us a bit about the work? 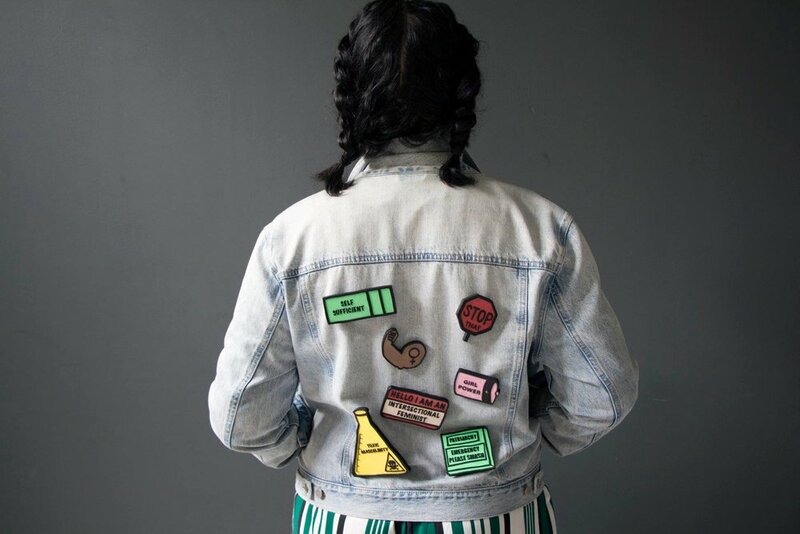 JASMINE: These badges are part of my Female Empowerment series which all of the designs are surrounding topics relating to feminism, and everyday phrases used to encourage people to feel good about themselves. I wanted my pieces to be current yet still pay homage to the history of feminism as badges have deep political roots, being at the forefront of protests for years. I did a lot of research into the votes for women campaign and other famous feminist movements and protests over the years, then comparing the signs and images used to the more popular enamel pin culture of today. Pin badges have had a huge resurgence in recent years and have become popularised by millennials and young companies creating colourful and relatable pins for a new generation to adorn themselves with. 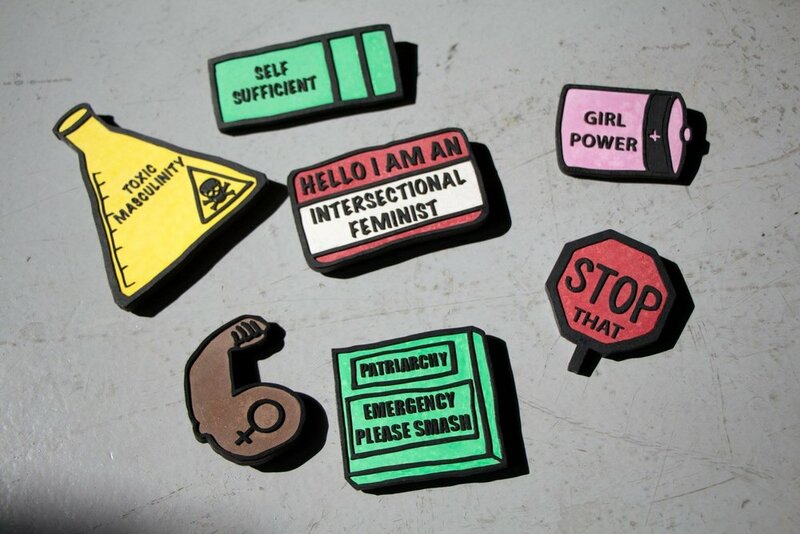 The badges I create when worn are intended to enable the wearer to feel empowered within themselves and encourage conversation with others, and hopefully then inspire viewers to feel empowered themselves. Empowered women empower women. UKYA: They are really striking and quite unusual in comparison to other badges. Can you tell us about how you make them? JASMINE: My process involves drawing my designs using symbols and phrases from my research and transferring this into a physical laser cut wood object. Then I poured jesmonite, coloured with paint/gouache, into the wooden mould, sanded it back until flat, individually stuck each of the top thin plywood layers on and to finish the whole thing was waxed. The most important part of my process is the designing as the finished pieces are intended to look very graphic and tactile as objects. UKYA: How do you feel about winning the UKYA Associate Prize at New Designers? JASMINE: Winning the UKYA prize is such an incredible feeling, after graduating from uni it can be super daunting as a new artist trying to make their mark on the art world, so being offered the opportunity to work with such an amazing organisation as UKYA gives me an incredible sense of pride and gratitude. I am also really excited about being part of the City Takeover in Nottingham, as I am from Lincolnshire which is right next door to Nottinghamshire, so being part of an arts festival within my region is a huge honour. It feels like I am really coming full circle after leaving my home town of Skegness to study down south and coming back up north to be part of such an exciting arts event. I am really excited to start working with the team at UKYA and creating a series of tokens for the event, and also meeting wonderful like-minded people at the takeover! Jasmine Ellie Brown is a mixed media jeweller/artist, she uses bright and illustrative designs to generate statement pieces surrounding social and political issues. She uses her drawings and directly transform them into laser cut pin badges which have a light hearted nature but a strong voice and a clear message. Jasmine's aim is to create work which is inclusive to everyone and relating to real people and their opinions. Jasmine recently graduated from UCA Rochester with a BA in Contemporary Jewellery, exhibited multiple times locally in Kent and also at New Designers Part 1 2018 where she won the UK Young Artists Associate Prize and has been given the opportunity to be part of the Nottingham City Takeover in 2019.